The BlueBox is our latest addition to the family of Water Treatment boxes and acts as an above ground partial water treatment system. Designed to provide an economic alternative to inconvenient and expensive groundworks, the BlueBox removes the need for excavations, interceptors and tank installations. The BlueBox is totally surface-mounted, designed to replace the requirement for an interceptor. BlueBox can be used with the Morclean wash pad (or your own wash pad), and where water is discharged to a mains foul drain. 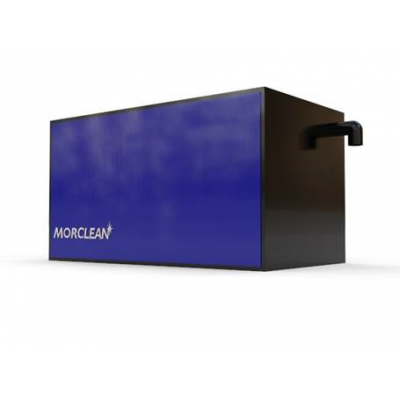 The Morclean BlueBox requires just a power supply to operate the system and is perfect for treating the outflow of a washbay and/or carwash without the necessity of a below ground interceptor, the BlueBox has one inlet from the wash bay and one outlet to a mains foul drain. Requiring minimal installation, the BlueBox is semi-portable and can be moved if the car wash relocates.